Ah, memories... I was at the show this CD was recorded at. It was ProgDay 1997 in Chapel Hill, North Carolina and I distinctly remember the entire crowd on their feet waving their lawn chairs at the band in homage to the beauty of their set. As ProgDay festival host Peter Renfro says, you can't have too many Italians at a progressive rock festival. And Finisterre are among the best of the current crop, playing a killer brand of classic Italian progressive rock, Genesis styled prog, and hints of jazz fusion. All members are outstanding musicians, each shining in his own right but typically playing together as a tightly knit ensemble. Boris Valle's keyboards have that wonderful symphonic sound, but also contribute the jazz influences. The addition of flute embellishes things nicely. And when Stefano Marelli's guitar takes over we're firmly in the classic majestic progressive realm. The first part of Finisterre's set consisted of "In Limine", "Orizzonte Degli Eventi", and "Hispanti", all from their In Limine CD. "Orizzonte Degli Eventi" is one of the highlights, being a fiery 15 minute epic that takes all the prog rock thematic twists and turns, from light and ethereal to thunderous intensity, smoothly flowing guitars and keyboards to obstacle course start/stop rhythms. Marelli's guitar can make an audience swoon with a mere handful of notes. A mellotron-like backdrop gives the music an orchestral quality though we also hear moments of frenetic jazzy keyboard runs. A great track. Next up is a smoking cover the PFM's "Altaloma". And the next four songs all from their first self-titled CD. Fans with their mindsets firmly in the 1970s will warm quickly to these tracks as they are the most classic progressive styled of Finisterre's music. "Macinaaqua, Macinaluna" is a powerhouse roller coaster ride with constant shifts in pace and theme. Blazing rock, quirky rhythmic patterns, and gorgeous playing from all. Fabio Zuffanti is a passionate vocalist and the listener need not understand Italian to feel the emotion. "Phaedra" is another standout track. The band really takes off later in the tune while the members are introduced. The band seems to launch into an informal prog rock jam during which we hear little snippets of In The Court Of The Crimson King, 21st Century Schizoid Man, and a guitar bit from an old Genesis song, the title of which escapes me at the moment. If memory serves me this is the one that got the crowd rocketing to their feed and going bananas over this talented band. 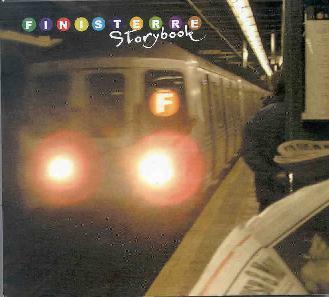 In summary, if you're a fan of classic Italian progressive rock then Finisterre really are among the best. Definitely a band that can drum up sweet memories of yesterday while still sounding fresh and exciting. All the ingredients are here... beautiful soaring guitars, keyboards, flute, and great vocals, though most of the music is instrumental. The CD's I have are all a few years old. But when I just visited their web site they say they've taken a somewhat new direction and threw out names like Porcupine Tree and Ozric Tentacles so I'm very interested in hearing what they sound like now. For more information you can visit the Finisterre web site at: http://www.finisterreproject.com. Storybook is distributed by Moonjune Records. You can visit their web site at: http://www.moonjune.com/.